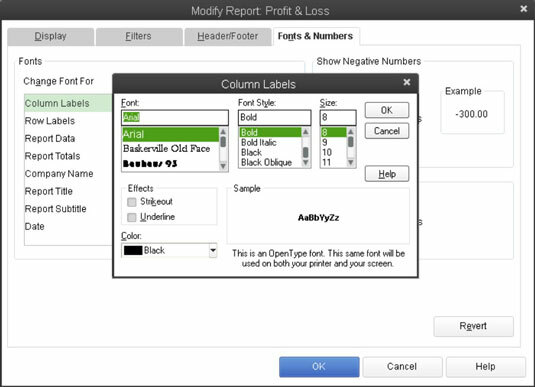 The Fonts & Numbers tab of the QuickBooks 2013 Report window lets you change the font for selected pieces of report information. Use the Change Font For list box to select the bit of report information that you want to change. After this selection, click the Change Font button to display a dialog box. The Column Labels dialog box appears, for example, when you indicate that you want to change the font for column labels. Use the Font box to select the font for the column labels. Use the Font Style box to select the font style for the column labels. Use the Size box to select the point size for the column labels. Optionally, use the Effects check boxes to add or remove special effects. Or, get really crazy and use the Color box to select the color for the piece of report data. When you’re finished, verify that your font formatting choices look right by using the Sample box — and then click OK. When you click OK to close the dialog box used to change a font, QuickBooks displays a message box, asking if you want to change all the related fonts. If you do want to change the fonts — and you probably do — click Yes. Note that if you make some change that later turns out to be wrong, you can click the Revert button, which also appears on the Fonts & Numbers tab, to return to the default formatting for fonts and numbers. The Show Negative Numbers area provides radio buttons and a check box that you can use to instruct QuickBooks to provide special formatting for negative values. Typically, QuickBooks shows negative values with a minus sign in front of the value. Alternatively, you can tell QuickBooks to place parentheses around the negative values (select the In Parentheses radio button) or to display them with a trailing minus sign (select the With a Trailing Minus radio button). You can also use color to flag negative numbers (select the In Bright Red check box). The Show All Numbers area provides three check boxes that you can use to clean up and simplify your report. If your business is large enough that your report values are very large, select the Divided By 1,000 check box. In that case, QuickBooks divides all the report values by 1,000 to make them easier to read. 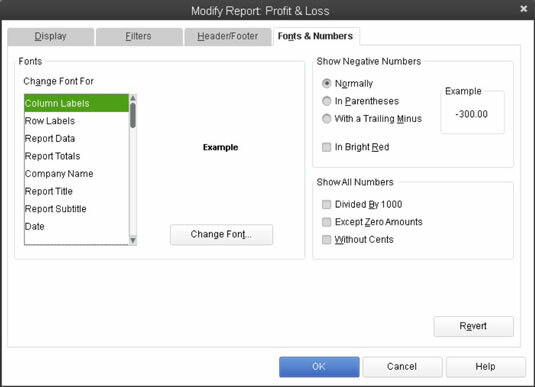 If you select the Except Zero Amounts check box, QuickBooks simplifies your report by not showing zero values. Finally, if you select the Without Cents check box, QuickBooks shows only dollars and not cents. If you find yourself becoming overwhelmed with the amount of data being presented in a report, the Show All Numbers check boxes provide a handy way to get a somewhat clearer view of the big picture.